A new way to Follow Life Love and Hiccups so you don't miss a thing round here. | Life Love and Hiccups: A new way to Follow Life Love and Hiccups so you don't miss a thing round here. A new way to Follow Life Love and Hiccups so you don't miss a thing round here. Pin It You guys may or may not have noticed my posts have disappeared lately from your Google Reader. That's because I got rid of the Google follow Me Widget. So how can you follow my blog now? Well you have a couple of options, you can wait until I update a new post as a link on my Life Love and Hiccups facebook page, which is good, but if I forget (which could quite possibly happen) or you don't get on to facebook everyday, you may miss it. The next 3 ways are much better in my opinion as you will never miss a post (assuming you don't want to miss a post). 1. You can subscribe to an RSS feed using Feedburner. 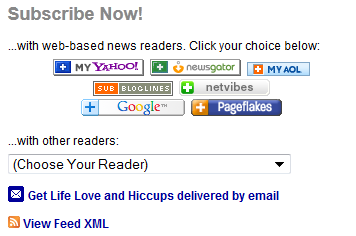 This gives you the option to add Life Love and Hiccups to whatever blog reader you use. Just click on the little orange button you see on the right hand side of my blog. You can also click on the other buttons which gives you the option to follow me on Twitter, Facebook, Pinterest or send me an email. When you click on the orange button, it will bring up a little box (see below) and you can choose whatever reader you want to add my blog too. Easy Peasy. 2. The second way is subscribe to my posts by email. This means every time I write a new post on the blog, it will be delivered direct to your email inbox. To join up this way, just type in your email address and hit submit. Both of these options you can find on the right hand side of my blog. 3. Finally (thanks to the advice of A Parenting Life) you can follow me on Networked Blogs - the widget is also on my side bar. I'd love you to join up in whatever way suits you so you are kept up to date on what's going on over here at Life Love and Hiccups. I'm really sorry to the loyal Google Friend Users for the inconvenience, but please don't blame me - blame Google Friend Connect for not working properly and my evil Gemini Twin with the really bad temper!